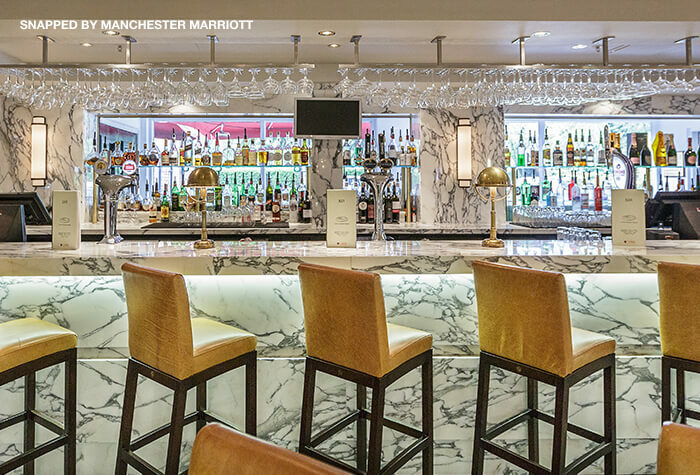 The Marriott at Manchester airport is an elegant hotel where the luxury speaks for itself. 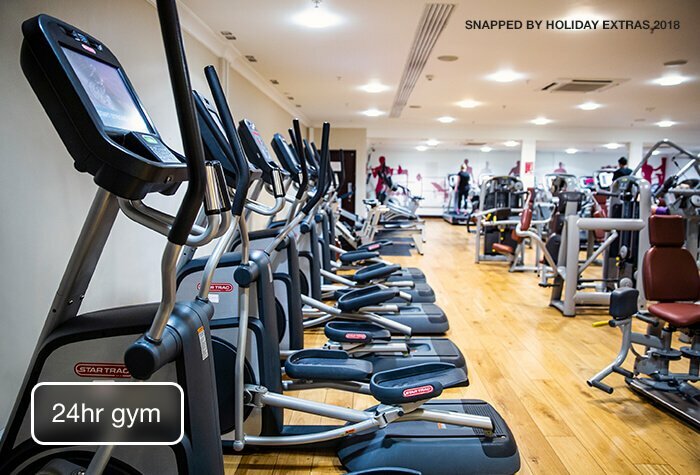 Housing gym and spa facilities as well as a choice of eateries, youll be spoilt for choice whatever you decide to do. For a peaceful night before a busy day of airport travel, you cant get any better. 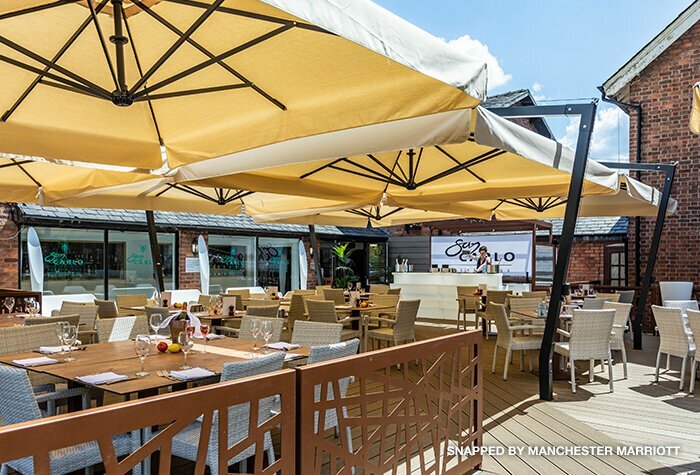 Whats more, you can also book the Marriott Manchester airport with parking included, saving you the money and time you may have spent arranging them separately. 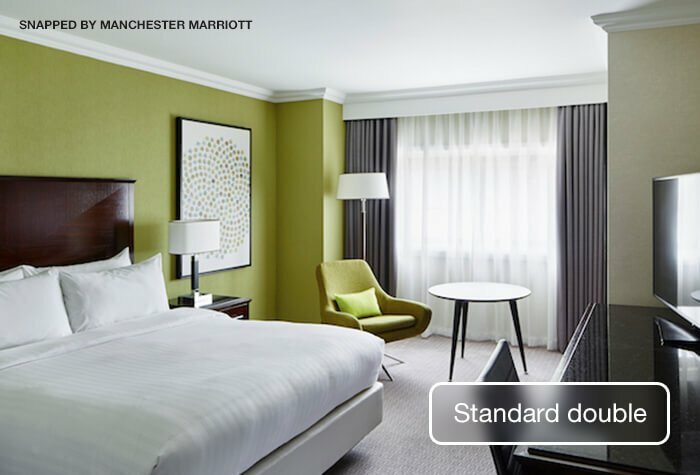 Of all our Manchester airport hotels, choose the Marriott for contemporary, comfortable and well-equipped rooms, aiding the perfect night's sleep before you fly. The hotel stay was lovely, however the tranasfers were awful, loads of people complaining. The hotel only has 1 mini bus therefore people were queuing and waiting for a very long time. This 1 bus serves all terminals.. not a very good experience. The Marriott was fabulous. Easy, quick and courteous driver to the airport. Car parked there was safe and ready for us on our return. very helpful excellent , just coming back , had to hang about in cold waiting for shuttle . 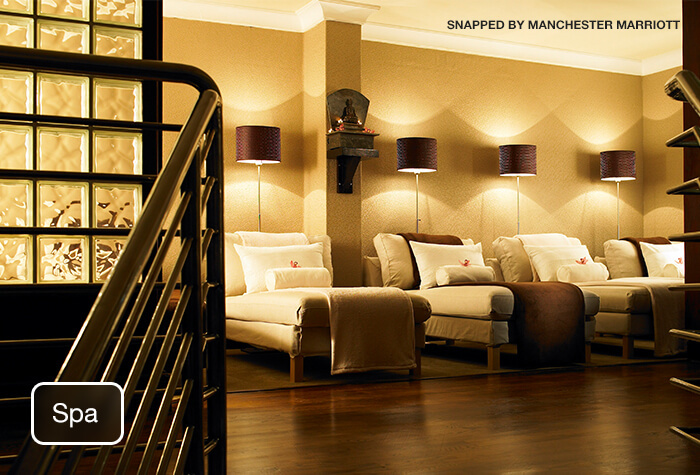 Our customers rated Marriott on average 9/10 (513 reviews). Read Marriott reviews. A shuttle bus to the airport is included in the price and the journey takes around 4 minutes. The bus runs from 4.30am - 10pm 7 days a week. You can book your seat when you check in. If youre travelling outside of these times the hotel can arrange a taxi for you instead which costs £10. The Marriott is a 10-minute drive from all terminals in good traffic. Detailed driving instructions and a postcode for satnavs will be on your confirmation email. Check in from 4pm. Check out by 12 noon. Guests say rooms are bright and spacious. 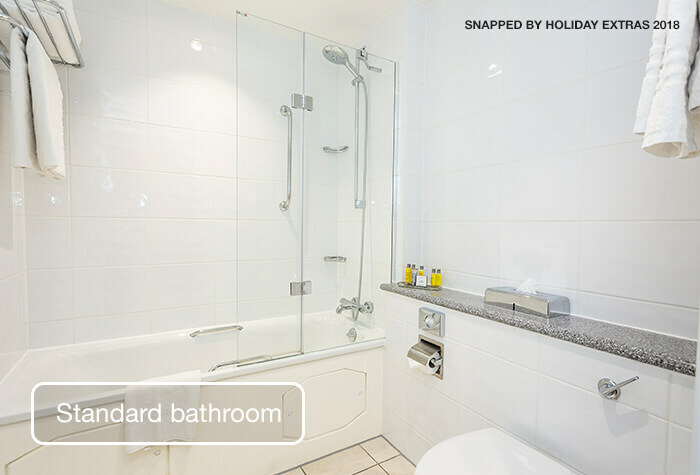 All rooms feature soundproofed windows and air conditioning. Upgrade to an executive room for £26 to get access to the executive lounge, free continental breakfast and non-alcoholic drinks. Wifi is free in the lobby and public areas. High-speed wifi in rooms is £15 for 24-hours. The hotel has 2 restaurants to choose from. 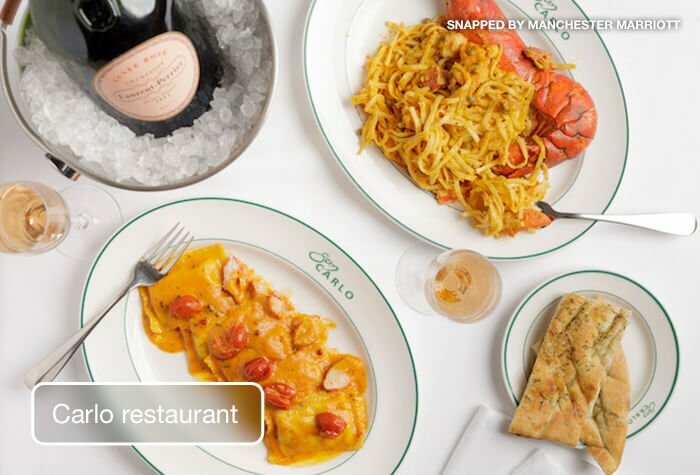 San Carlos offers classic Italian food choices, such as anti-pasti, pasta, pizza and seafood. Main meals average around £25. Guests say that although it can be a little expensive, both the food and service is excellent. Please note that you will need to book a table in advance. 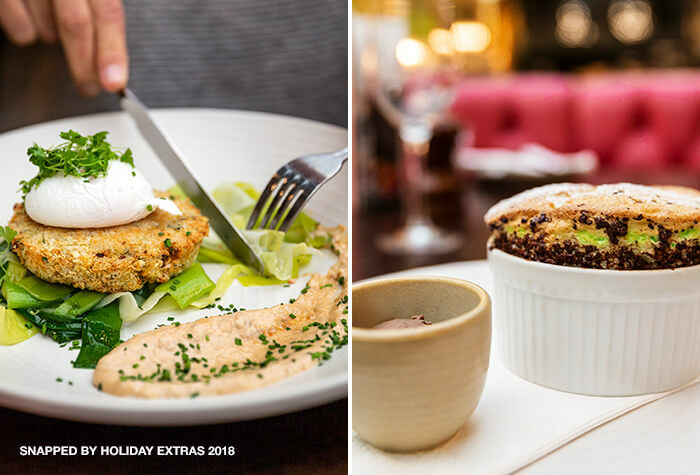 The Brasserie Blanc offers classic food choices such as burgers, steaks and salads. 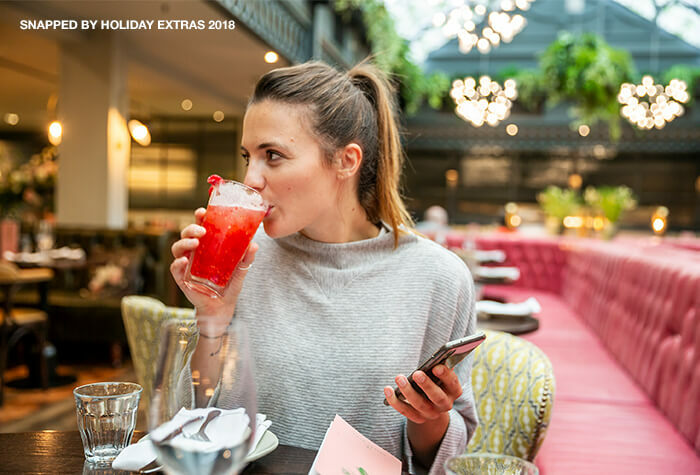 Main meals average around £15, or you can book a 3-course dinner for £25pp through Holiday Extras. The restaurant also has a kids menu. Both restaurants offer vegetarian, vegan and gluten-free options. The hotel recommend you talk to a member of staff before you order to discuss it with them. The Lounge bar serves soft and hot drinks, spirits, wines, beers and cocktails. They also have Illy coffee and food served between 7am - 11pm. Food options include burgers, sandwiches, sharing platters and salads. Main meals average around £14.50. A glass of wine averages £6.70 and a pint of beer averages £4.50. 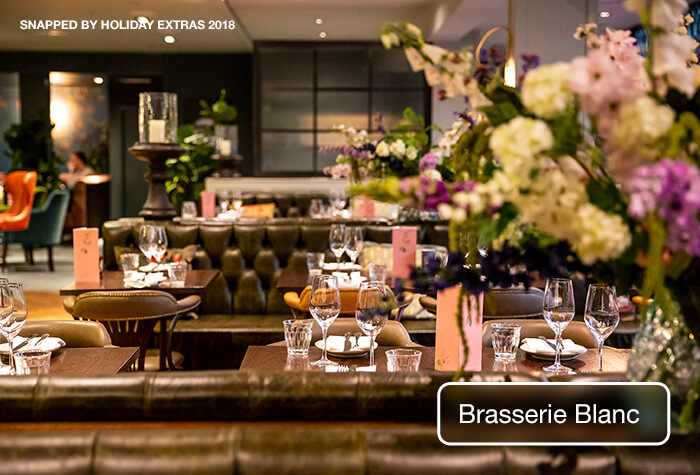 A full English and continental buffet is served in the Brasserie Blanc. Full English breakfast is £16.50pp for adults and £8.25pp for kids under 12. Need breakfast on the go? You can book a take-away breakfast bag the night before at the hotel for £8.95pp or grab a coffee from the on-site Illy. Please note children are allowed in the pool between 7am and 7.30pm only. Disabled facilities The hotel has a some rooms that are accessible to disabled guests. 1. Check in is from 4pm - your confirmation email will include driving directions and a postcode for sat navs if you need it. 2. 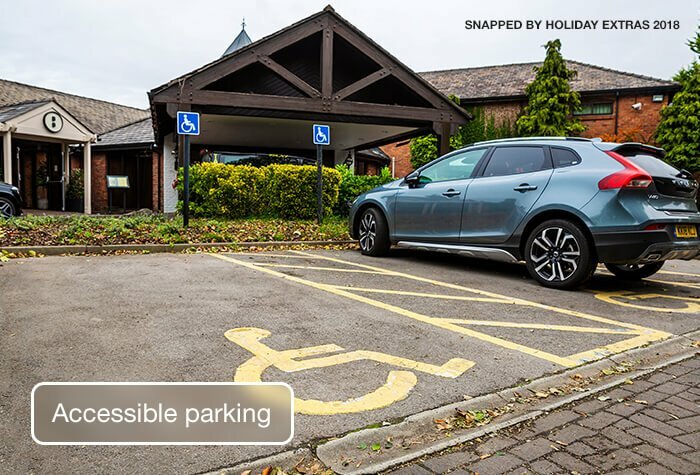 Guests can park overnight at the hotel for £11. When youre ready to go to the airport, take the shuttle bus to the terminal or take a taxi which will be approximately £10 and the journey will take around 4 minutes. Make your way to the hotel - check-in is from 4pm. Park anywhere in the hotel car park and keep hold of your keys. When you check in book your seat on the shuttle bus for the next day. Having booked your seat the night before, take the shuttle bus to the terminal. Its included in the price and runs between 4.30am - 10pm 7 days a week. Itll take around 4 minutes to all terminals in good traffic. Take the shuttle bus back to the hotel and collect your car from the hotel car park. Call the bus from the yellow courtesy phone at the airport - therell be a direct number on your booking confirmation. When you arrive: Park in the hotel's car park overnight. 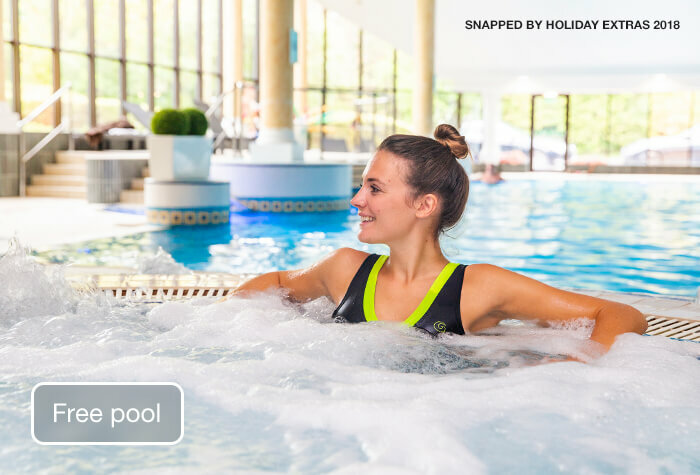 While you're at the hotel: Unwind in the hotel's relaxing spa while you make the choice to dine in either the hotel's Source grill or the Player's restaurant. In the morning: Grab a sumptuous buffet breakfast at the hotel, then drive to the airport's valet car park and have a member of staff park your car for you while you make the short walk to the terminal. When you get back: Walk back to the valet car park and collect your car. 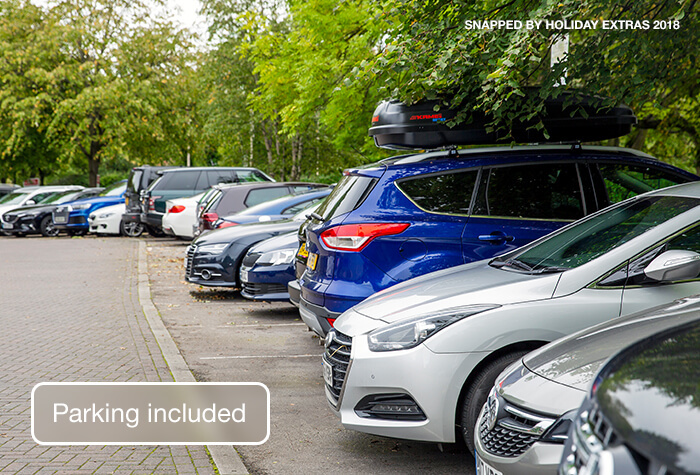 Secured parking for the whole of your holiday is included in this package. Make your way to Skypark before going to the hotel. Youll need to call them 30 minutes before you arrive to let them know youre coming. Take your confirmation to reception. Theyll take your keys and park the car for you. 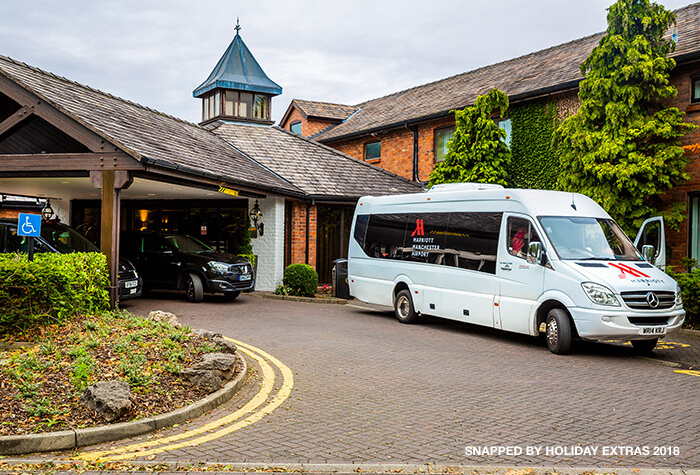 The car park will arrange a shuttle bus to the hotel- its included in the price. Skypark has CCTV and barrier entry. When you check in to the hotel book your seat on the shuttle bus for the next day. Head down to the train station on the ground floor and call Skypark, the number will be on your confirmation. They'll send a transfer bus to come and collect you. When you get back to the car park, head to reception where you'll be asked to show some photo ID and can pick up your keys. Then you can collect your car and drive home. You'll park overnight at the hotel. In the morning, take your car to Jet Parks where it will stay while you're away. Buses run from Jet Parks every 15 minutes, 24 hours a day. It takes around 5 minutes. Transfers are included in the price.